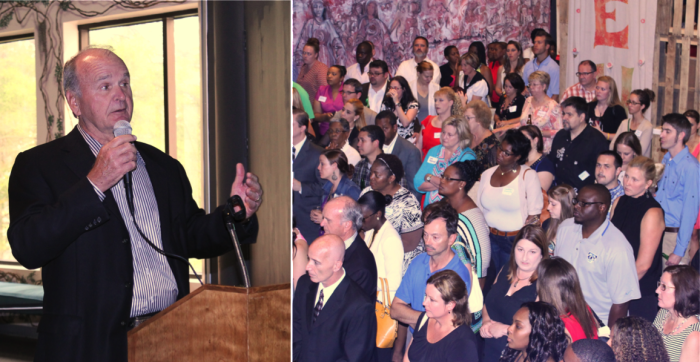 On Friday, April 25, Quality Education for All Fund Advisory Board Chairman Wayne Weaver, Superintendent Nikolai Vitti, School Board members and other district staff were joined by more than 200 teachers in Duval County Public Schools who qualify for performance incentives in the Transformation Region. Weaver spoke to the group about the integral role teachers play in helping students succeed. Teachers from throughout the county attended the event at the Museum of Science and History to learn more about the initiative, which will provide up to a $17,000 bonus to high-performing teachers who transfer to a Transformation Region school, and will also provide up bonuses of up to $20,000 per year to retain high-performing teachers already working in the Transformation Region. Teachers who apply to transfer will go through an interview and classroom observation process.